What is the implication if a person believes in the Holy Week? When should a man follow God’s commandments and be holy? Basing from the Bible, what are the erroneous practices that take place during the Holy Week? Can anyone be a messenger? Does God consider the nation where a man comes from? What characteristics would qualify a man to become God’s messenger? Are there prophecies in the Bible that speak of the Philippines? 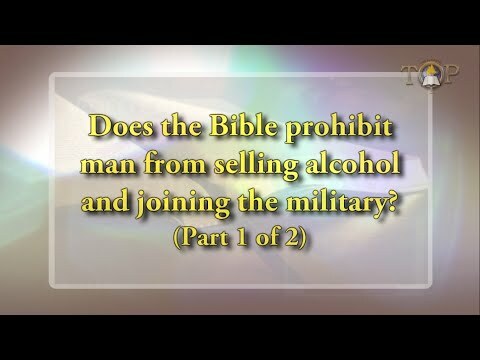 If the Bible prohibits alcohol drinking, is it logical to say that it also prohibits man from selling those products? God commanded that man should not kill, does it follow that man should also not join the military where he would have to kill at one point? What is the explanation behind God’s prohibition of eating hares or rabbits? To whom was that commandment given? Are we included in the group of people who must obey that law? What should we eat in our time now? Whose teachings should the Christian generation follow? Is it possible for a man to be baptized with the Holy Spirit and fire without being baptized with water? Is there an order as to when these baptisms should be received? Can God be called a murderer? In the biblical sense, who is considered a murderer? Who has the right to give or take away people’s lives? Why do earthquakes happen according to the Bible? What causes the anger of God? Is it true that God blesses us only on account of our good works? Is it biblical to say that we can be blessed by giving tithes and offerings? What does God require so that we may receive blessings from Him? In Matthew 24:24, does the anti-Christ refer to one particular person or a group of people that form an organized group collectively known as the anti-Christ? What nationality and religion does the anti-Christ come from? How does the Bible define the anti-Christ? Did Mary really descend from the lineage of David? Is she part of the Judah’s tribe? Is the Bible dedicated in paying attention to genealogies?